A puzzle that will enlighten and entertain! 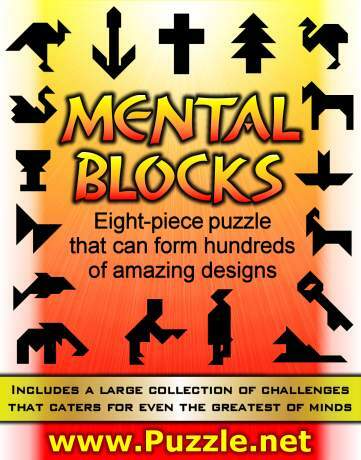 Mental Blocks is an eight-piece wooden mind puzzle. The challenge is to find out how to arrange all the pieces to form each of designs in the included booklet, which contains 165 challenges! The puzzle can form: A Christian cross, Christmas tree, emu, kangaroo, butterfly, dolphin, dog, swan, bird, bear, fish, whale, goat, bell, key, people, and hundreds of other interesting designs. Unlike other puzzles, this puzzle will keep on puzzling! Mental blocks are for people of all ages who enjoy being mentally challenged and stimulated. Take a look in the photo album. The booklet contains challenges for all levels of mental competence and ability. Some of the challenges will test even those most intellectually gifted. If you're a parent, and wish to keep the kids busy for a few days or hours, Mental Blocks is the answer! (Tip: offering a reward for each completed challenge may be helpful) Forget about all those electronic gadgets that kill creativity, give your kids Mental Blocks! If you're an employer, then you could use Mental Blocks to test the mental dexterity of potential employees. Mental Blocks is for anybody that desires to test and stretch their mental abilities, patience, and creativity! Mental Blocks are a fun way to fight off the mental decline associated with old age. Keep that brain active! As they say, use it or lose it! Do you want to take your mind off something? like the stresses and pressures of life? Mental Blocks are a great way to relax and clear your mind. You can have competitions with your friends and family to find out who has the best brain for Mental Blocks! It is easier if you buy more than one set. This Puzzle was designed in Australia by Terje Ronneberg, and it's sold directly by the designer to customers worldwide. Each set of Mental Blocks comes packed in a clear plastic case. The Puzzle is cut from 1.1cm thick solid wood. If you're familiar with the ancient tangram puzzle, this puzzle is much more challenging and exciting. A great gift for any occasion, such as birthday, Christmas, thank you, get well, thinking of you, I love you, congratulations, apology, anniversary, confirmation, graduation, Easter etc. It's a nice gift for Christians, since it can form the shape of the cross, the symbol of Jesus and Christianity! Give Mental Blocks to your friends, family and even to your enemies! Next Easter, puzzle your friends and family with Mental Blocks! It is a great puzzle for Easter time! Have a look inside the Mental Blocks photo album. Read some of the feedback received about Mental Blocks. The cost based on your order, and payment method. Upon arrival of your product, if for whatever reason you are unhappy with the product, I will refund the full purchase price. A few customers have requested some images they can print out themselves, which are the same size as the Mental Blocks, so they can arrange the puzzles on top of the printed page. I have put 16 of my favourite designs into a document, which you can download here. If you would like more, there are many more in the four files: Animals, Objects, People, Shapes. Can't read Word documents? Install the free Word Viewer. The Truth is the greatest puzzle of all!